The Doctor is on his holidays, and he’s serious about giving away some of his hard-earned medical bonuses. Could this 5 reel online slots be the remedy for your online slot woes? If so join your favourite smarmy doctor at the hotel bar and roll the dice to engulf in a tropical experience filled with everything you could possibly imagine, this slot game will bring the party season to you with its magnificent gameplay as well as it's high-quality graphics that are sure to tickle your taste buds. NextGen Gaming pride themselves on maintaining the balance between gaming innovation and the ‘proven fundamentals’ to create fun online slot games. With a philosophy of ‘Attract,’ ‘Entertain,’ ‘Retain,’ this developer strives to create an environment that players would want to return to again and again. Founded in 1999, NextGen was one of the pioneers of platform-specific gaming, creating a community of inspiring work, and gaming innovation. Recently joining hands with Poker Stars New Jersey, USA. They have developed classic games; Mad Mad Monkey is one of the more well-known titles from NextGen – with hopefully more to come in the future! If you want some easy slots promotions then click here to visit the site. Dr Love on Vacation is, admittedly, one of the more well-known titles from NextGen. 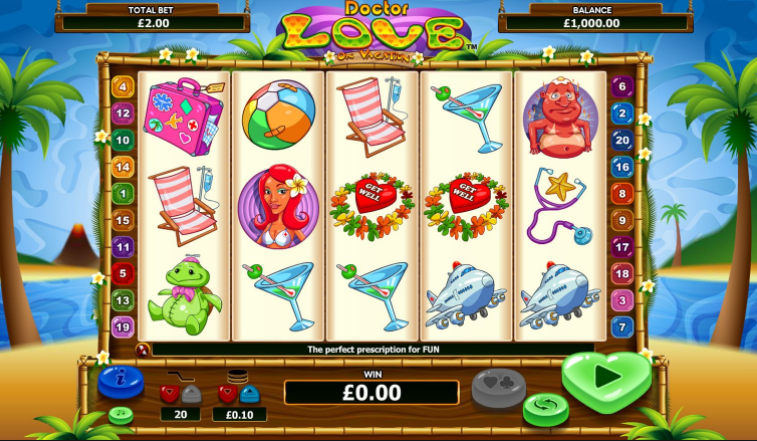 The original online slot game in this series – Dr Love – was just begging for a sequel, and it is completely understandable that players who enjoyed the original were waiting for this with bated breath. 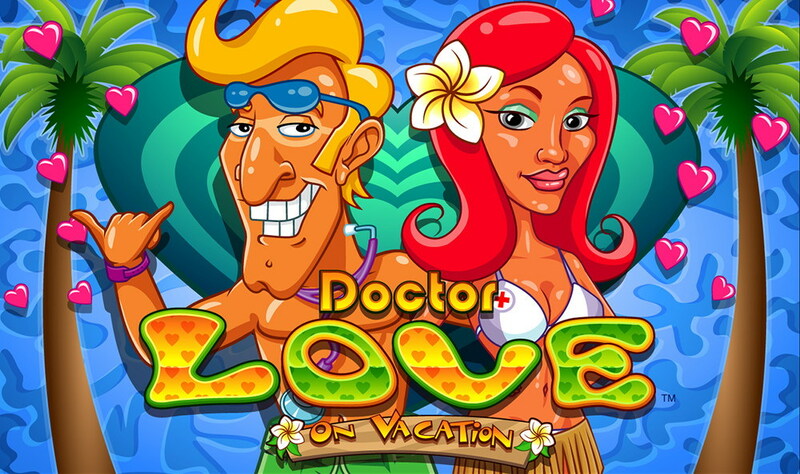 With the sultry Dr Love on his well-deserved holiday, this slot game is graphically very similar to the original; with stereotypically stylised palm trees and sandy beaches, Dr Love on Vacation creates an environment we all want to escape to. Even, possibly, the inclusion of a towering volcano on the horizon, this idyllic theme is mirrored with the sound effects. Slow lapping waves and birds tweeting… this is the life! The only downside to this pleasing theme is the noise that plays during every spin – this gets incredibly repetitive, and you should not be ashamed if you need to turn it off after a while! As usual, we see a 4 x 5, twenty-five pay line game, playable from 0.20 per spin. 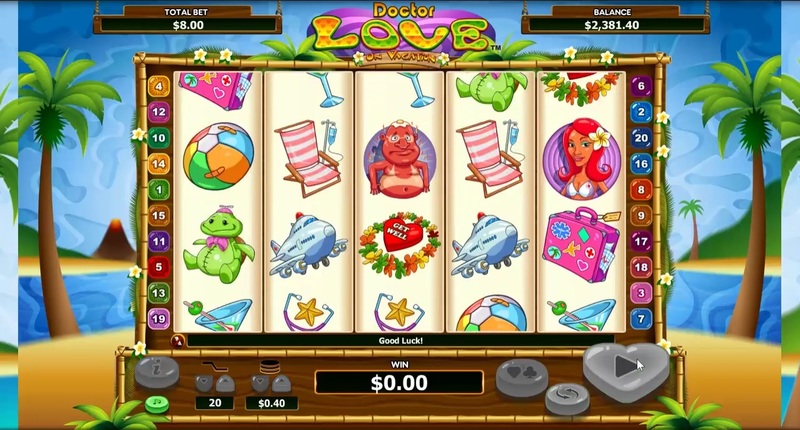 Dr Love himself acts as the Wild in this slot; being able to be substituted for every symbol (except for the other specials) to create potential jackpot combinations. In fact, the eponymous character doubles all wins that he is involved in, allowing the player to reach dizzying heights in regards to winnings. Even the scatter symbols are themed appropriately with the game, as a lifeguard’s surfboard. This particular scatter has the potential to create a combination of winning spins, as when you get three, four, or five of these in one spin, you are given twelve, sixteen, or twenty free spins. During this time, all prizes are tripled. On top of this, if you get the Dr Love wild, he will multiply the win by a further 6x! We're sure you'll fall in love with our top slots game, Play now! If you are willing to risk it, you should never forget about the gamble feature. If you guess the colour or the suit of the next card that appears in front of you, you can double your winnings! Keep in mind you are only allowed to do this five times, so be careful! If you are a high roller you will not be as punished for a loss as with other games, as you are allowed a maximum of 50. Learn more about how to pay by mobile, visit the site here! All of these features mean that you have no reason not to enjoy Dr Love on Vacation. You may even strike lucky! An equally barnstorming game is our Lucky Irish online slot.